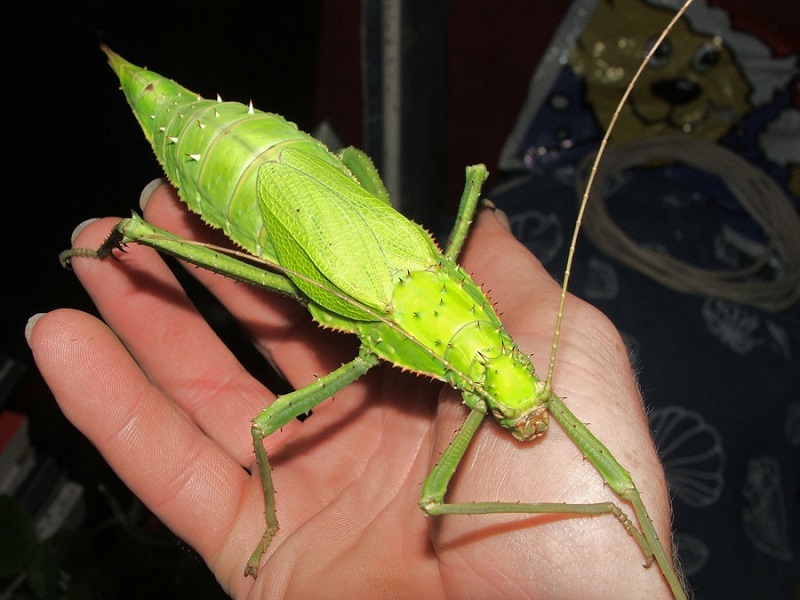 The Jungle Nymph (Heteropteryx dilatata) also known as Malaysian stick insect, Malayan jungle nymph, or Malayan wood nymph, is one of the larger members of the Phasmatodea. It originates in Malaya and is predominantly nocturnal. This particular insect holds the world record for the largest egg laid by an insect. The eggs are about 1.3 cm (0.5 in) in length. Females reach a length of 25 centimetres (9.8 in), one of the world's heaviest bugs, and the males a length of 10 centimetres (3.9 in). The females of this species are very aggressive and much larger, wider, and brighter-coloured than the male. The female is lime green and has short, rounded wings, however their short length doesn't allow them to fly. The males are much smaller and a mottled brown colour. Both sexes have small spikes on their upper bodies, more numerous in the female, who also has very large spines on her hind legs that can snap together as a scissor-like weapon. Females are born a beige colour, which fades as it moults, while the male is a darker brown. This species produces sexually. The female will deposit the dark, circular eggs in moist soil. The eggs take from 12 to 14 months to hatch. They eat bramble, oak, blackberry, raspberry, and ivy, along with other leaves. Their temperature conditions should be between 20 °C (68 °F) to 30 °C (86 °F) and should have a high humidity level, provided by spraying the enclosure with water. They live up to two years in captivity. Click HERE for a Jungle Nymph care sheet.